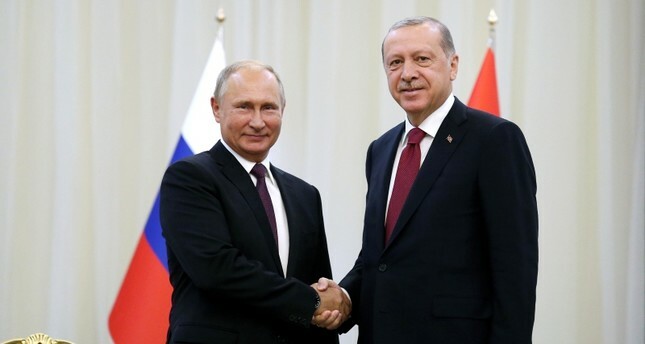 President Recep Tayyip Erdoğan will meet with Russian President Vladimir Putin in Sochi on Monday to find a solution to the Syrian conflict as part of Ankara's diplomatic efforts in avoiding a full-scale military operation in Idlib. Erdoğan's meeting with his Russian counterpart was announced on Friday by Turkish Foreign Minister Mevlüt Çavuşoğlu during his visit to Pakistan, and later confirmed by the Kremlin. Turkey has been conducting intense diplomatic efforts to avoid a possible full-scale military operation by Bashar Assad forces on the opposition-held Idlib province, in northwestern Syria. The meeting with Russia, one of Assad's main backers, will add to the diplomatic efforts by Ankara. Speaking at a joint news conference in Islamabad with Pakistani Foreign Minister Shah Mehmood Qureshi, Çavuşoğlu stated that Turkey "will continue efforts with Iran and Russia." Çavuşoğlu added that Turkey's efforts to avoid a massacre in Idlib have been welcomed by the international community and that the efforts will continue on international platforms as well. "We have received tremendous support from many countries as well as the United Nations and other organizations. Therefore, we should continue our efforts to bring peace and stability to the region." Russia is preparing for a possible meeting between Putin and Erdoğan on Monday in the southern city of Sochi, the Kremlin said, with the war in Syria set to top the agenda. "Such a meeting is possible and is being prepared," Kremlin spokesman Dmitry Peskov said Friday in comments carried by state news agency TASS. In a meeting with Putin and Iranian President Hassan Rouhani last week in Tehran, Erdoğan had pushed for a cease-fire in Idlib, amid preparations by Assad for a full-fledged operation to capture Idlib from the opposition, as bombings by Russian and regime forces continued. Putin and Rouhani resisted Erdoğan's call for a cease-fire in the Tehran summit and the bombings on Idlib have continued. Assad and his backing allies say there are terrorists in Idlib and that a military operation is the only way to clear the area of these terrorists. Turkey acknowledges the presence of some terrorist groups, such as the al-Qaeda-linked Hayat Tahrir al-Sham (HTS), however has said that there are nearly 3.5 million civilians in the area, as well as moderate forces in the province, and that an indiscriminate attack would lead to a humanitarian disaster. "If we can declare a cease-fire here, it will be one of the most important steps of the summit, and it will relieve the civilians," the Turkish president said during the Tehran summit. Ankara has asked for the halting of attacks on Idlib to push HTS to leave the region or force them to lay down their arms with the help of the moderate opposition. "The protection of civilians in the region, separating terrorist elements and protecting the current status of Idlib are crucial matters," Erdoğan had said at the end of the summit in Tehran. Ankara says while the regime operation would lead to a massacre, it would also cause a mass refugee wave towards its borders, causing a new humanitarian disaster. "Turkey is open to cooperation with everyone regarding efforts to fight terror groups in Syria," Çavuşoğlu stressed on Friday. He underlined that it is not right to kill civilians, children and women under the pretext of a fight against terrorism, as peace and calm cannot be reached in this way. He underscored that Turkey has been pursuing a clear and foreseeable policy regarding Syria and it seeks a political resolution to the crisis. Peskov was quoted in a Reuters report as saying that Putin had discussed the situation in Idlib with members of Russia's Security Council on Friday. Putin told the Security Council he was concerned by militant activity in the last major rebel-held stronghold in Syria, Kremlin spokesman Peskov was cited as saying by the RIA news agency in a Reuters report. Meanwhile, Turkey has strengthened its forces near the border in recent weeks and also sent military reinforcements to beef up Turkish observation points inside Idlib. Defense Minister Hulusi Akar and Chief of General Staff Gen. Yaşar Güler inspected Turkish troops on Friday in southern Hatay and Gaziantep provinces, along the Syrian border. As part of the efforts to limit violence in the country, Turkey, Russia and Iran had previously agreed to establish so-called de-escalation zones across Syria, including in the northern province of Idlib and parts of neighboring Latakia, Hama and Aleppo. Under the Astana agreement, Turkey established 12 observation points from Idlib's north to south aiming to monitor and sustain the current cease-fire agreement for the de-escalation zones, deliver humanitarian aid and ensure the secure return of displaced people. The first trilateral summit at a presidential level was held last year in Sochi and the second meeting was held in Ankara in April of this year.